Published: May 2, 2016 at 12:46 p.m. Updated: May 3, 2016 at 03:40 p.m.
Our annual fifth-year option tracker is live! Feel the excitement, internet. The rookie wage scale, created in 2011, requires all first-year players to sign four-year deals. Teams then have the option to exercise a fifth-year option for all first-round picks. The fifth year (2017 for those taken in the 2013 draft) is guaranteed for injury when employed. Some decisions are easy, like the Texans picking up DeAndre Hopkins or the Bills not picking up disappointing EJ Manuel. Others are a toss up. The 2013 draft class was one of the worst in memory, especially in the top 10, where Ziggy Ansah was the only true no-brainer pickup. No. 1 pick Eric Fisher, Kansas City Chiefs: The Chiefs announced they picked up the offensive tackle's fifth-year. Normally the No. 1 pick is a no-brainer, but the Chiefs took their time deciding to use the $11.9 million option on the underperforming blocker. No. 2 pick Luke Joeckel, Jacksonville Jaguars: Another disappointing pass protector. The Jags brought in Joeckel's replacement in Kelvin Beachum this offseason and has declined their fifth-year option. No. 3 pick Dion Jordan, Miami Dolphins: Jordan remains suspended after multiple violations of the substance-abuse policy. His contract tolls, making him ineligible for the fifth-year option. No. 4 pick Lane Johnson, Philadelphia Eagles: No need for a fifth-year option on the offensive lineman. Eagles executive vice president Howie Roseman already inked Johnson to a five-year, $63 million extension through 2021. No. 5 pick Ezekiel Ansah, Detroit Lions: The Lions exercised the fifth-year on the pass rusher on Monday. It was a no-brainer for Detroit. With the going rate for edge-rushers on the rise, keeping Ziggy for $12.7 million in 2017 is a smart move. No. 6 pick Barkevious Mingo, Cleveland Browns: The Browns are not picking up the fifth-year option for Mingo, sources told NFL Media Insider Ian Rapoport. He needs to have a big year with the new regime. No. 7 pick Jonathan Cooper, Arizona Cardinals: The Cards traded Cooper to New England, but the Patriots are declining the fifth-year option on Cooper, Rapoport reported. No. 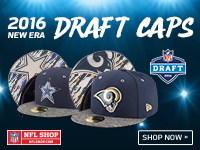 8 pick Tavon Austin, Los Angeles Rams: The Rams have picked up the fifth-year option for him, Rapoport reported. No. 9 pick Dee Milliner, New York Jets: Rapoport reported the Jets aren't expected to pick up the tab on the underperforming corner who has played just 21 career games in three years. No. 10 pick Chance Warmack, Tennessee Titans: The Titans have decided to decline the fifth-year option. No. 11 pick D.J. Fluker, San Diego Chargers: The Chargers picked up the fifth year for Fluker. There are some concerns after an injury-riddled 2015, but given their line troubles an extra year with the guard seems like an obvious choice. No. 12 pick D.J. Hayden, Oakland Raiders: Unlikely to be picked up after Oakland beefed up the secondary this offseason. It's been reported that Hayden might not even make the Raiders' final roster. No. 13 pick Sheldon Richardson, New York Jets: The Jets picked up the $8 million tab on Richardson. That's a steal. No. 14 pick Star Lotulelei, Carolina Panthers: Dave Gettleman will keep his first-round hog molly an extra year while he works on an extension for Kawann Short. No. 15 pick Kenny Vaccaro, New Orleans Saints: The Saints will take another year of the hard-hitting safety. No. 16 pick EJ Manuel, Buffalo Bills: The Bills won't pick up the extra year of the disappointing passer, Rapoport reported. That was a big whiff for Doug Whaley. No. 17 pick Jarvis Jones, Pittsburgh Steelers: Jones hasn't performed up to standards with just five career sacks, and the team has declined to pick up its option on him, according to multiple reports. No. 18 pick Eric Reid, San Francisco 49ers: The Niners picked up Reid's option for $5.7 million. No. 19 pick Justin Pugh, New York Giants: Big Blue snapped up the option. Pugh has been much better at guard than tackle. No. 20 pick Kyle Long, Chicago Bears: Where Long plays along the line has been a long-term discussion in Chicago -- he's moving back to guard. Keeping their best blocker in the Windy City an extra year likely took zero thought. No. 21 pick Tyler Eifert, Cincinnati Bengals: The Bengals weren't going to let the touchdown-machine reach free agency any earlier than they have to. Injury is a risk with Eifert, but at $4.8 million he's worth that chance. No. 22 pick Desmond Trufant, Atlanta Falcons: Perfect fit for Dan Quinn's defense. At $8 million in 2017, Trufant will be a bargain the next two years. No. 23 pick Sharrif Floyd, Minnesota Vikings: The Vikes' grabbed the fifth year on Floyd for $6.8 million, the team announced. No. 24 pick Bjoern Werner, Indianapolis Colts: Indy waived their first-round mistake this offseason. No. 25 pick Xavier Rhodes, Minnesota Vikings: Minnesota will keep its best corner around another year at a bargain rate, the team announced. No. 26 pick Datone Jones, Green Bay Packers: Ted Thompson didn't exercise Nick Perry's option last year, will he do the same with Jones? No. 27 pick DeAndre Hopkins, Houston Texans: Duh. No. 28 pick Sylvester Williams, Denver Broncos: The Broncos will not pick up Williams' $6.757 million option for next season. The nose tackle has 47 tackles and five sacks in three seasons. No. 29 pick Cordarrelle Patterson, Minnesota Vikings: After a promising start to his career, Patterson has bottomed out and became an afterthought in Norv Turner's offense. The Vikes have decided not to pick up his fifth-year option, Rapoport reported. No. 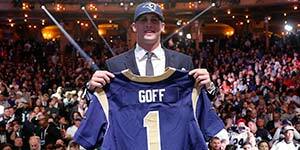 30 pick Alec Ogletree, Los Angeles Rams: The Rams have picked up the fifth-year option for him, Rapoport reported. No. 31 pick Travis Frederick, Dallas Cowboys: A no-brainer move for Dallas picking up the option. No. 32 pick Matt Elam, Baltimore Ravens: It's only fitting that this first round ends with another disappointing prospect that won't get an extra year picked up. The Ravens decided to decline the fifth-year option, sources informed of the situation told Rapoport.